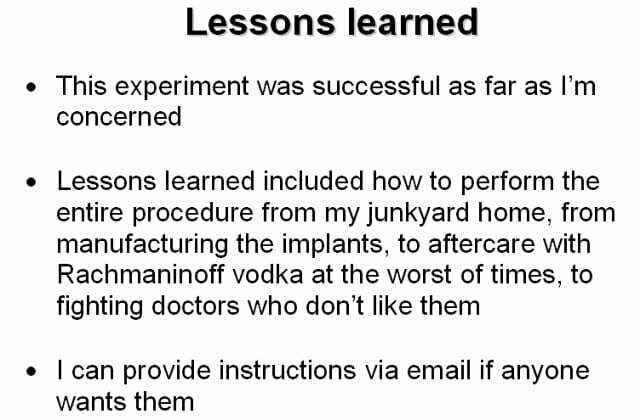 In this part Lepht Anonym gets into detail about neodymium implants, including the use of Sugru for bioproofing, and the results of her own experiments. 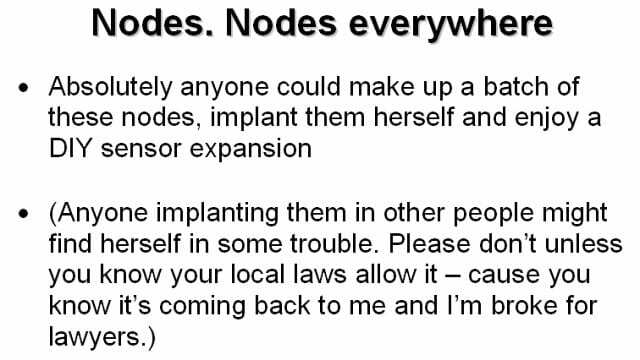 Successfully installed implants just function like any other sense you’ve got. They’re just there in the background. They’re not intrusive; they just set off when something’s there; they don’t when it’s not. Depending on how strong the field is… There’s an MRI lab in my university that I can feel from about 2 meters away. It’s just like an interesting local range sense. What precisely this sense is, I don’t know. It’s some kind of EM field, it comes off devices, it comes off power lines; I don’t know exactly what it is; some of you probably will, because I’m not very bright. Like I said, that’s my half-baked theory about magnetic resonance: when you come into contact with fields, the magnets resonate and generate electricity. I don’t know if that’s right; it’s probably not. Max Planck would probably choke me for saying that. But it doesn’t matter to the function device; they work no matter how well you know them. They work if you don’t know they’re there. Could be tested via double blind; hasn’t been tested yet; would accept any testing. Lots of people ask me: “Is this actually worth it?” The sense is rudimentary, it’s short-range, it’s very, very crude. If curiosity is not your thing, please don’t go doing this to yourself, because it’s not for lots of people. Most transhumanists’ dreams are all about immortality and eternal youth, and wanting to become superman, and wanting to walk up the walls like Spider-Man and stuff, and it’s just not going to happen. This is very crude, very hacky transhumanism. If you want eternal life, you need to go bother somebody else. Second part of working with these things was that the components themselves, as I said, are actually very expensive. They’re coated in medical-grade silicone, they’re made of various magnets, they’re coated in gold as well – they’re not cheap to get. I’ve actually spent all of my grant on one set of them. The official ones you can only get from Haworth or from his supplier, so, 2 places. They’re like unobtainium; they’re pretty much impossible to get hold of (see right-hand image). The import rules are weird on them, and you get taxed, like, 20% of the value, and it’s just not worth trying to get these things to a country where they are not made. 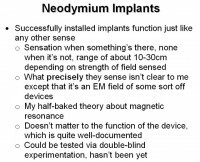 But the component is very simple – it’s just neodymium, which you can buy on mass, non-coated. The problem is the coating of gold and silicone. 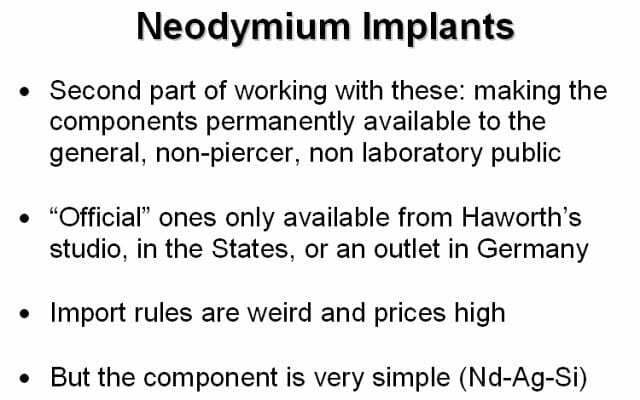 And so, somebody showed me: if you google “neodymium magnet discs” you can get 4 or 5 industrial suppliers. You can buy a bag of these things for the price of Haworth’s one. 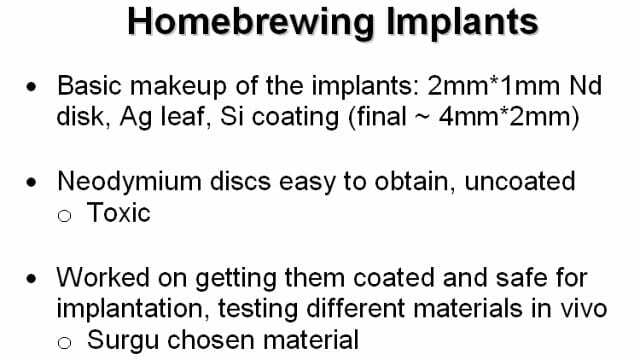 So, all you have to do is basically mimic what these guys are, and they’re tiny little 2mm wide, 1mm deep neodymium disc coated in gold leaf – not necessarily coated in medical silicone. So, the final is about 4mm by 2mm, and, like I said, they’re very easy to obtain uncoated. But they’re toxic; they’re really, really toxic. Don’t put them in your fingers raw. They need coating, because they’ll poison the crap out of you. So, I was working on finding a way to coat them in a material that will coat them properly, that you can get without using injection mold, that you guys could take out of a packet in your kitchen and use. Finally I found one, which is what somebody else showed me online. It’s called Sugru. If you google this, you can buy this in little packets. It’s really strange, it’s like moldable silicone rubber, like play-doh that hardens into silicone. So, if you buy this stuff, obviously, really easily you can just coat stuff up. You can coat whatever the hell you like. 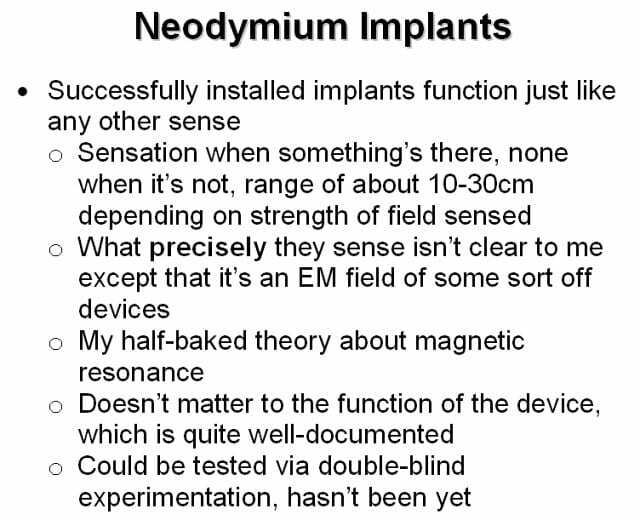 I’ve tested loads of it on neodymium; I’ve tested loads of it just plain in the body. I’ve got lumps of it that have been there for 6 or 7 months. It’s completely non-toxic, it doesn’t do anything, and if you can’t get hold of Sugru, you can also use hot glue from a glue gun, because it’s the same thing. Lots of things inside me are coated in hot glue gun glue, because it just seems like sort of a perfect bioproofer. Superglue – bad idea. I’ve tried this before and I almost lost a fingertip; don’t do it. You may think it’s the same thing, but it’s not. 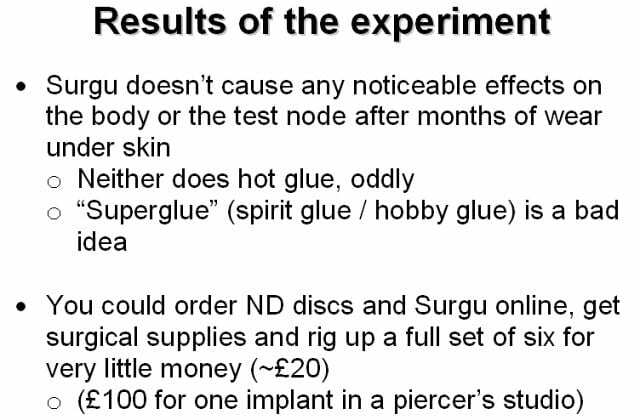 You can order the discs and some Sugru online, get some needles and some sterilization gear and a friend to help you out. You can do the whole thing for maybe 20-40 quid; that’s 6 implants and a lot of pain at once. But if you do it all at once, it will be very cost effective. Like I said, it costs about 100 quid. You could maybe get 1 for 100 quid in a piercing studio, and then you have to find a piercer to get it, because they don’t do anything like this anymore. There’s one guy in Germany here in Mannheim that does it, but that’s about it. So, like I said, if anyone wants complete instructions for this, I can give it to you, I’m just not sure whether I’m allowed to give it to you here, so email me. You’ll probably get the procedure just from what I’ve said, anyone can do this. Absolutely anyone can make a whole batch of these things and give them to everyone, except I think that’s illegal, so don’t. Please don’t put them in anyone else, because a friend of mine got into real trouble for that. You can put them in yourself, you can be your own guinea pig, but I think having other people as guinea pigs makes you kind of a mad scientist, so don’t. Just check your local laws first (see image above). This one was pretty much one of my most successful experiments, it’s the only one that I finished. I learned how to do the entire procedure, so I can give step-by-steps to anyone who wants it. 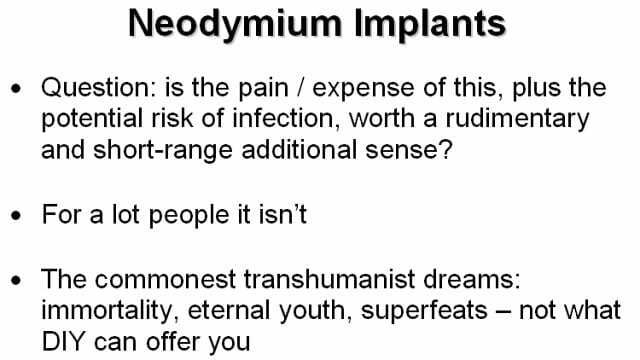 I know how to manufacture the implants on actual budget rather than ridiculous gold leaf budget. I know everything about aftercare. These things are pretty much a success. I just wish people would sort of like them. The only thing is that they feel kind of nasty for about 2 weeks after you put them in, so do expect some grossness, because it’s really nasty. Like I said, just email me if you actually want step-by-steps.